Ama Dablam. All images courtesy Anna Bolmat. The drop into nothingness comes without warning. Jolting to a halt in the darkness, Philipp and I conclude that we’ve managed to rip out an anchor. Whether it’s the thin air at 6500 metres or simply exhaustion, neither of us bats a frozen eyelash. We still have a whole lot more downhill to get through and the icy wind is not showing any signs of abating. Presenting a heady combination of technical challenge and aesthetic appeal, Ama Dablam (6812 metres) is commonly called ‘The Mountaineer’s Mountain.’ Located in the Khumbu Valley, Nepal, the stunning peak dominates the skyline for the many trekkers on their way to Everest Base Camp. Labelled “unclimbable” by Sir Edmund Hillary, the mountain was only summited for the first time in 1961. 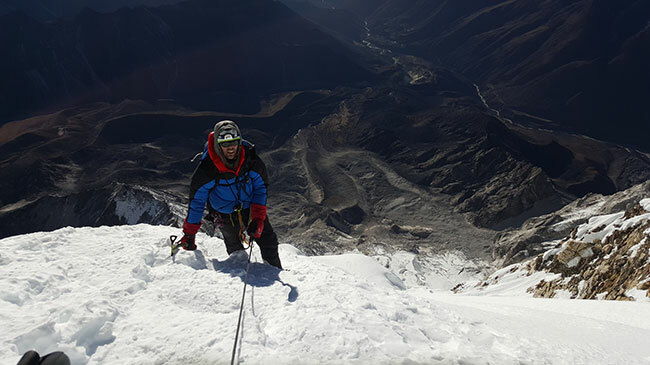 I have admired Ama Dablam's intimidating ridgeline since my first trip to the Himalayas almost 10 years ago and now I'm back to make a bid for the top. 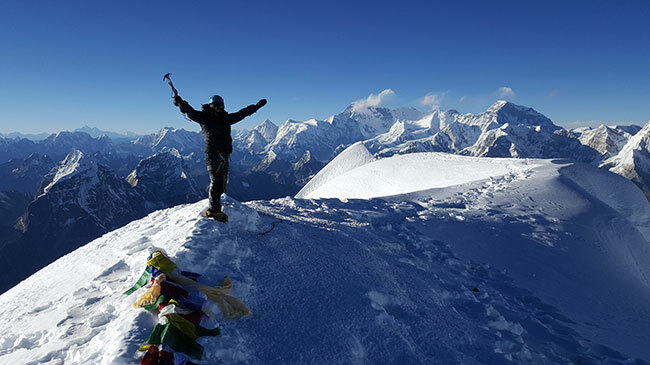 My partner Philipp and I take a leisurely week to trek to basecamp, enjoying nights in teahouses, carb loading and swapping stories with trekkers and climbers from all over the world. We follow the canyon carved out by the icy Dudh Koshi River before having our last apple pancakes in the small village of Pangboche, leaving the main trail and heading up to Ama Dablam basecamp. Although I have nothing but appreciation for Philipp’s version of French toast and baked beans, skilfully conjured up on the MSR XGK, jealousy may have kicked in when we heard about the hot showers and pizza ovens in some of the more sophisticated camps. We are roundly mocked by our neighbours for attempting dahl without a pressure cooker. Patience is certainly a virtue – both when climbing and cooking! 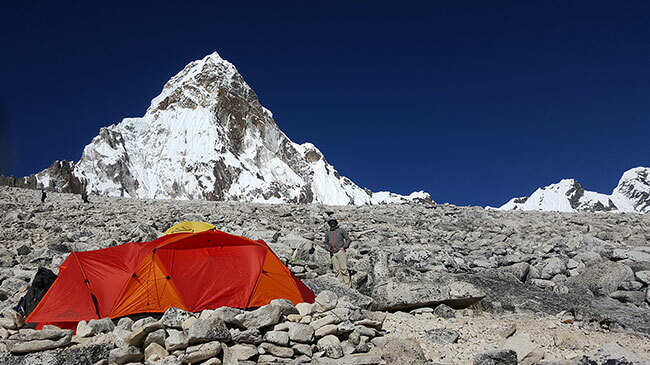 Using three camps above basecamp, we spend the better part of two weeks shuttling gear and food between base at 4500 metres and Camp 2 at 5900 metres. 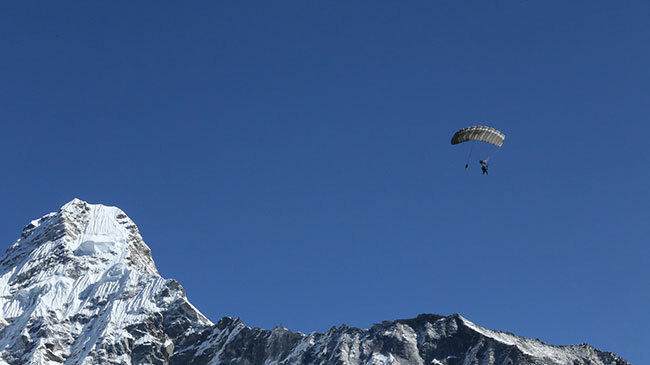 On our rest days, we are entertained by prolific aerial antics; from a day of military parachutes being tested out of helicopters to a bold French duo paragliding off the summit and cruising into basecamp like they are stepping out for a coffee. We also witness a number of impressive feats including nail-biting, ‘long line’ rescues high off the mountain. 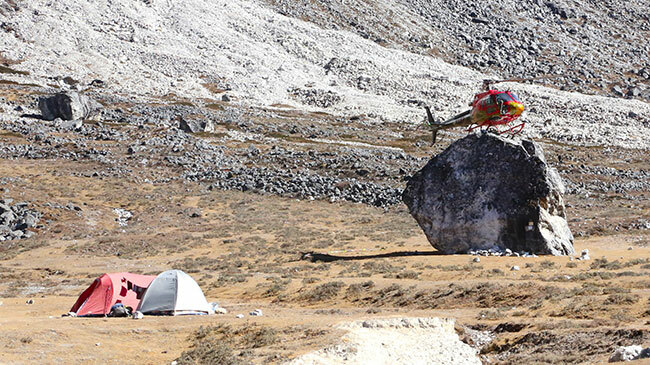 And we laugh every time the pilots insouciantly descend into basecamp, wondering whether sending tents flying in all directions is their way of letting off steam. Setting out in the inky darkness from Camp 2, our first challenge on summit day is the Grey Tower. More usually covered with snow and ice, this unrelentingly steep section surprises us by being a true rock route this season. Some beautiful airy traverses follow as the sky grows lighter and then it's finally time for some ice action. The snowy, overhung ‘mushrooms’ prove challenging and I wish for a second ice tool. After an interminable slog up the last steep snow slope, we pop out on the cricket pitch–like summit. Everest, Cho Oyu and Lhotse form part of the majestic Himalayan panorama before us. This feels very close to the top of the world! The wind picks up and I make a valiant attempt to eat some of our summit stash – Haigh’s dark chocolate. Having frozen solid, it tastes like a very bitter, disappointing mouthful of earth. Suddenly we realise that we are just like Alice in Wonderland’s White Rabbit; late, so very, very late! Darkness overtakes us several hours later, and the temperature drops to around -34 degrees Celsius. We continue our descent, testing each anchor and rope. Not thoroughly enough it would seem, as we experience that discomforting moment of weightlessness! After a few less eventful hours, we make it to Camp 2.7. There is a sole, unoccupied tent, perched precariously under giant icicles. Crushed by the long day, and not feeling inspired enough to tackle the sketchy traverse above the Grey Tower in the dark, we curl up in the tent and wait for sunrise. The bright sunshine thaws us as we descend to Camp 2, where warm down sleeping bags, hot drinks and food feel like five-star luxuries. Unfortunately, I give the remainder of the descent negative five stars. 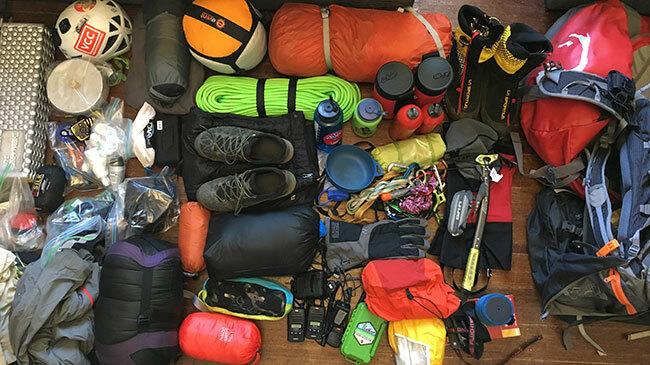 My summit euphoria evaporates as we lose altitude and gain kilo after kilo of gear as we pack up each camp. The trail from Advanced Basecamp is so familiar now that I could do it with my eyes closed, so how can it possibly have stretched out even further? I start thinking that it's time to learn how to paraglide! RAB Vapour Rise Alpine Jacket – worn every single day of the trip. La Sportiva Primer shoe – the only day these had a break was summit day! Edelrid Huascaran Harness – ultralight and comfy for mountaineering. See our range of mountaineering equipment.